How can the risk of attack and burglary be reduced? To reduce the risk of attack and burglary, we will act precisely on each of those three parameters. To avoid the attacker proceeding with his malicious act, we may for example raise awareness of the penalties to which they can be subjected. We can also focus on the objective by increasing the difficulty of access, by reducing the temptations and knowledge of its surroundings. Lastly, the methods and means of action are the specific point on which we intervene as manufacturers of physical-security solutions. The sole reference at European level for the assessment of the performances of burglary-retardant joinery is the set of standards EN 1627-1630. These standards offer a classification system made up of six categories (1 to 6 in increasing order of burglary resistance) and describe the test methods used to assess the resistance of these elements to static and dynamic pressure, as well as to manual burglary attempts. Standard EN 1627 describes the test conditions and resistance classes. The doors, windows and partition walls are subjected to a force exerted by a machine at various more ‘sensitive’ points. This pressure is 3 kN for classes 1 and 2, 6 kN for class 3, 10 kN for class 4, and 15 kN for classes 5 and 6. For your information, 10 kN is more or less equivalent to a load of 1,020 kg. The resistance to dynamic pressure is assessed by aiming a mass of 50 kg onto three impact points. For classes 1 and 2, the release distance is 450 mm; for class 3 it is 750 mm. For classes 4 and above, the standard does not provide for any tests under dynamic pressure, with the resistance under a static pressure being very high and sufficient. While for ballistic resistance the results are assessed, here it is the means that are of paramount importance. The standard describes the means (force, tools, duration, etc.) implemented in order to perforate a hole with the minimum defined dimensions. The tests result in a pass if in the allocated time, the template objects (a rectangle, an ellipse and a circle) cannot pass through the openings possibly made during the test. 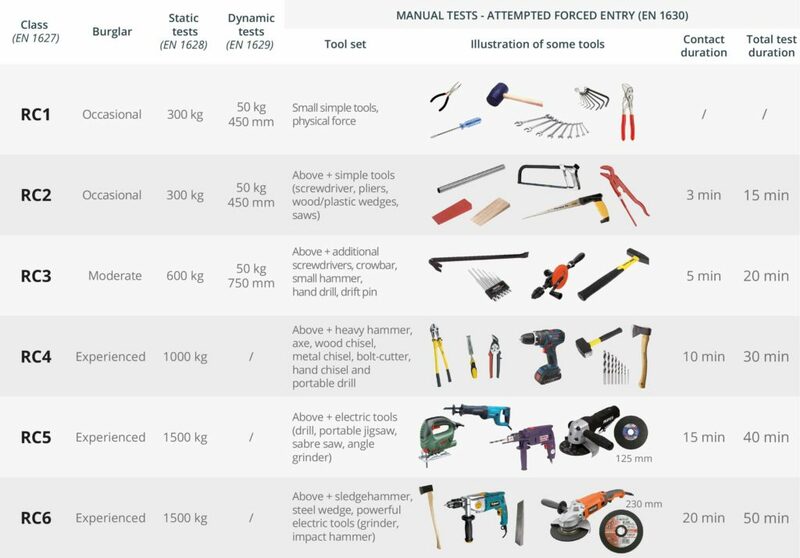 During this test, a different set of tools is supplied to the ‘attackers’ for each class.